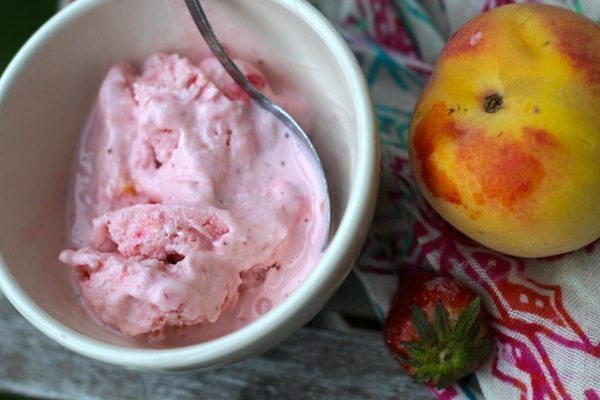 Peak peach season is coming to an end so make sure you get your hands on the last of those sweet summer peaches to throw together this Strawberry Peach Frozen Yogurt. 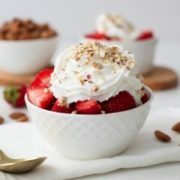 This is for all of you with an insatiable sweet tooth looking for some healthy treats. Fruit, as we all know, is key to a balanced, healthy diet. Strawberries are loaded with antioxidants. Antioxidants help the body protect against diseases such as cancer. They are also a great source of fiber. Peaches are high in vitamin A, niacin, potassium, and are a very good source of vitamin C.
The Greek yogurt addition to this frozen yogurt gives an added protein pack that is higher than regular yogurt to make this a well balanced snack. Greek yogurt is just another type of yogurt that is processed to remove the whey (or the watery part of the yogurt) to create a thicker consistency. All yogurt is also full of probiotics which help to keep our gut bacteria healthy, improving digestion and immune system function. 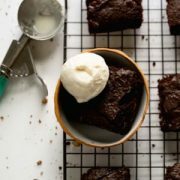 The best part about this recipe is that it is so easy to make. Begin by chopping the berries and the peach and freezing for at least three hours. Once the fruit is nice and frozen, blend the frozen fruit together with the Greek yogurt until it is one smooth consistency. Pour the mixture into an airtight container and freeze for at least another three hours. When you are ready, place a couple of scoops into a bowl and enjoy! This recipe is super delicious and an excellent option for that sweet craving. It also goes great when you’re trying to cool off on those hot nights. Savor the summer and whip together this recipe. 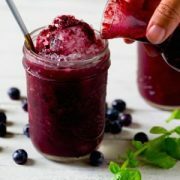 The fruit in the recipe can be swapped for any berries or other fruits you have that you would enjoy. What kinds of fruit do you like to add to your frozen yogurt? Let us know what you think in the comments below! Scoop out into a bowl and enjoy! Thanks for all of these great recipes! I became a vegan due to health problems and weight loss…. I made the blackbean browies and they were so good thanks ladies I look forward to growing with you thanks for sharing with me and my family God bless you both!